Dog agility is fun; both for dogs and their owners. It also requires a disciplined process of training that further strengthens the working relationship between dog and handler. Practical clothing required! Dog agility has become very popular in recent years and has never been more accessible.There are hundreds of groups throughout the UK, some run by qualified, licensed and insured, trainers-some not. 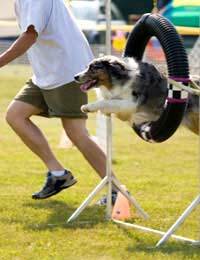 For the beginner, who wants to find out more about dog agility in the right conditions, it’s a good idea to ask around locally to find out which dog agility clubs have the best reputation and, if possible, go along to see how the classes are run before committing to any of them. Dogs under 1 year old are not encouraged because they are still growing. The commands for agility training can then be worked on. A helper at these classes may be asked to move heavy equipment and sometimes have to run. Fast! A reasonable level of fitness is therefore desirable in both people and dogs before starting. The higher the level of agility, the more athletic it becomes, although some well-trained agility dogs are run by skilled handlers who give commands from wheelchairs. The Dog Walk is made by joining three planks together, one of which is about 8-12 ft long and raised above the ground, supported by the other two, shorter, planks that act as ramps. There are often contact zones either end. Weave poles are the dog agility equivalent of slalom for skiers! The dog must weave its way through a line of upright poles (varying from 5-12 in length) without missing any. An A-frame is 2 platforms, hinged together, to make an upright letter A shape. The dogis trained to go up one side then down the other. Not as simple as it sounds. Competition agility dogs will have to use contact zones at the start and finish of this frame, they may also be required to pause at the top. Seesaws or teeter-totters look similar to the children’s version seen in playgrounds, but for the dog’s safety, they are not exactly the same. The dog steps onto one end of the seesaw, walks along it as moves, then off the other end. Contact zones are often used here too. There are several different variations to the basic jumps, or hurdles, used in dog agility depending on the level of skill and the dog’s size. Jumps consist of upright bars that supporta horizontal bar over which the dog is expected to jump. The pause table is exactly that-an elevated, usually square, platform. The dog is trained to jump onto it on command and then sit/stay/lie down for a specified time-usually about 5 seconds. Getting into dog agility training is good fun and very rewarding for both pets and people.For the beginner who wants to get involved, as a helper or with their own dog, it can seem that there is a lot to learn! Learning the names of the pieces of equipment first is useful. The important thing is that handlers don’t expect their dogs to be brilliant, brave and fast because each dog will learn at its own pace! Instructors will stress the importance of warming up properly first and not demanding too much. They should also make sure that it is fun and that beginners reward their dogs as they learn.